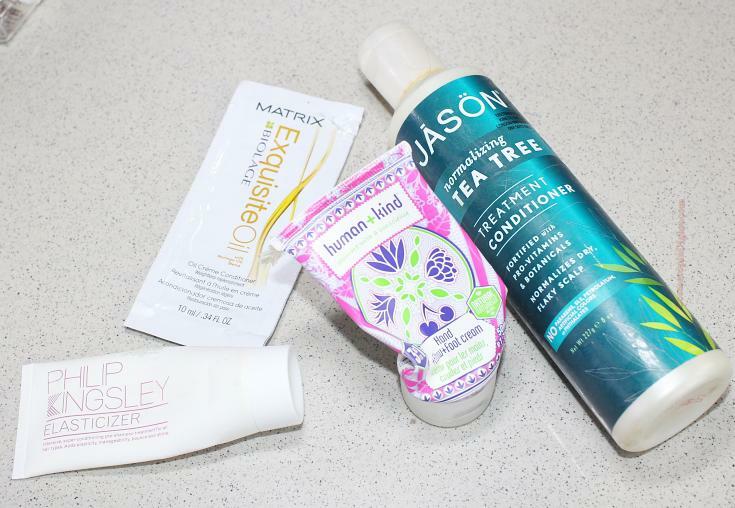 In September, I haven't managed to use up as many products as I usually do - a bout of viral 'flu, followed by a stint of severe motion-sickness meant that I ended up skipping my skincare routine for a few days. And I have a medium-sized pimple on the middle of my cheek to show for it. Scroll down for the beauty products used up in September 2016 and my quick impressions of each. I generally like Aesop products and therefore expected this to be a great cleanser. It was quite ordinary and did not do a good job of removing makeup or SPF or even my overnight sleeping pack. There was enough for three uses and I was pleased to get to the end of it, really. Despite the TERRIBLE name, this product only removes makeup. Think of it as a mid-point between those bi-phase makeup removers, and micellar water. It was alright - I didn't love it for liquid lipstick or waterproof mascara. It dealt well with lightweight makeup, that is all. Repurchase? No, Bioderma is better. If I hadn't already fallen in love with Alpha-H's Clear Skin Face Wash, this would have become my favourite morning cleanser. It is creamy, non-foaming and beyond gentle. Repurchase? I prefer the Clear Skin Face Wash from the same brand. Did a neat job of removing mascara, though I had to swipe a few times. Works well with micellar water, though I prefer one-step oil cleansing. Repurchase? Not once the box is over. A 28-day intensive skin treatment programme that is meant to stimultate cellular regrowth. I've been loving this. Each ampoule is supposed to last two days - I can get through a week with just the one. A whipped essence that you apply before a serum or ampoule. Contains 84% snail mucin. Along with a bunch of other products, has been reducing my scarring. Repurchase? Oh yes! I have three bottles of this. My third bottle. 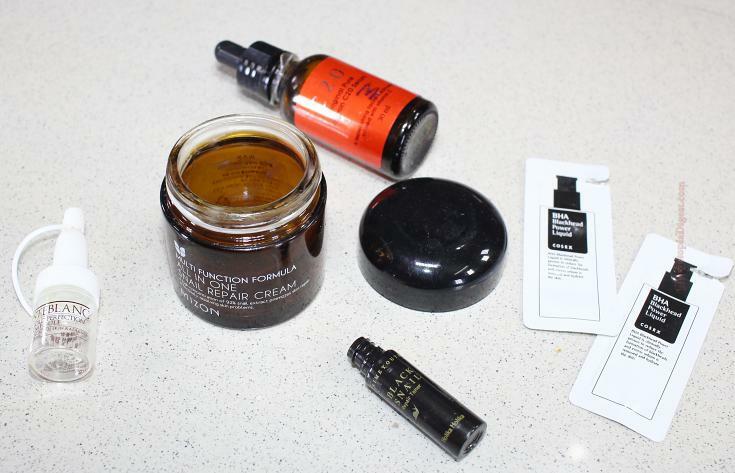 Best, EPIC Vitamin C. Destroys post-acne pigmentation so quickly, it makes my head spin. Strong stuff. I find that Korean "skincare specialists" such as CosRx, Benton, and Mizon work better than brands such as Etude House and Holika Holika. This toner couldn't hold a candle to, say, Benton's famous toner. My acne-prone skin just loves CosRx. They make the best AHA/BHA toners, with low pH. Repurchase? Already have a full bottle open. If I had the budget, I would only ever use this while washing my hair. Provides intense, deep conditioning and nourishment in minutes. Fabulous. Repurchase? I'm hoping I get this in a few Advent Calendars. If not, I'll buy. A rather greasy condish that made me want to shampoo afterwards. Thankfully, I only had the one sachet. Reviewed here. I LOVE this brand and this product. It is perfect for travel. Repurchase? I have two more of these left. Unfortunately, it doesn't seem to be available online, or outside of Sephoras in Europe. Let's see. Great when your scalp is flaky. I used this as a CO-wash and it got rid of dandruff in one go. Repurchase? I have Yes To Carrots' scalp treatment condish to use up next. After that. What beauty products have you been loving or hating in September 2016? Tell me in the Disqus comments widget below. And, here are some other beauty posts for you to check this week. 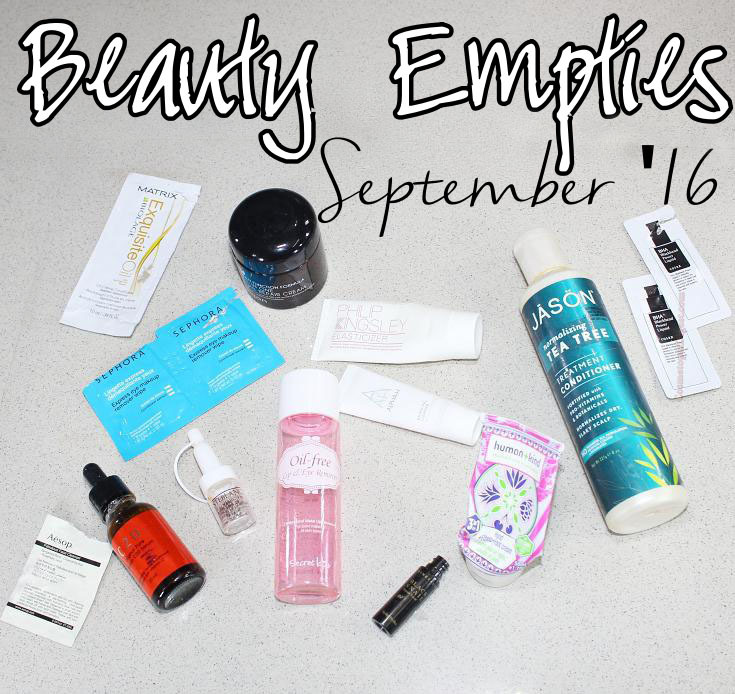 If you have done an empties' post this month, or are planning to post one before October 10, please do come back and link up! You can grab the InLinkz code here for your blog.